We developed a new logo and corporate identity, then applied this to their website, business cards and stationery. Part of the project brief was to include the facility to list property available for lease. 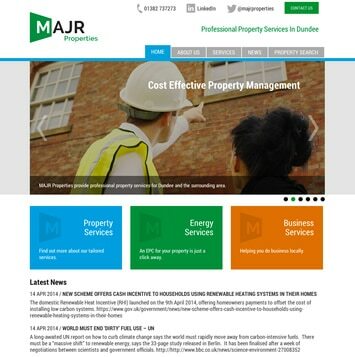 As part of the website we included a simple database of properties that MAJR staff could administer, with the flexibility to include both commercial and residential property, either for sale or rent. The property section displays all properties on a map allowing visitors to get a quick overview of what is available in their area. The site was built with a responsive design, so it would look great to visitors viewing on a desktop, tablet or mobile phone.